I chose to view this based on preview of the production. The title sounded boring. I stand pleasantly corrected. Very informative. As a new RIA, I have to say this interview resonates with me the most. Most of the other interviews on this website deal with the gladiatorial exploits of hedge fund managers. The reality is most retail investors are not hedge fund investors. Marc Cojones and his shorting exploits are science fiction to most people - that is why they probably love the interview. Nobody gets to do this in real life. It's like watching a Stars Wars movie. Most people deal with what David Hay deals with - how to have your wealth properly positioned for preservation and growth. My favorite part is his honest account of how hard it is to deal with people, their emotions and current observations and prepare them for the future which inevitably is not what the past is. Who would think in 1982 that the market will go up for 20 years amidst declining inflation after 20 years of going nowhere in the late 60s and 70s amidst ever rising inflation? Likewise who would think that the market might go nowhere for the next 20 years amidst rising inflation today? Stuff like this is unthinkable based on observable past experience. By far my favorite quote coming out of this is "better look like an idiot now than later"
Really excellent. I’ve done a lot of work on my taxable accounts over the last several years but this talk made me realize that as I approach distributions I need to think hard about the tax-deferred accounts which have largely been on auto pilot for nearly a decade. December 2018 was a wake up call but I didn’t really wake up until I watched this interview. And God has reached down and given me a 9% bump in the last month, so the timing couldn’t be better. Keep bringing it, Grant; you’re the best. 21st December 2018 The Fed/ Brexit/ QT/ Int/ China/Cyclical CRASH of 2018 This interview was done in October 2018, he explained why Cash is a position and what he said actually came true. Algos in control wave after wave of selling, relentless. Some may have been sceptical in October, now they will be trying to get on his mailing list. Smart Money!! Buy the DIP became Sell the Rally........ from here only this kind of money manager will survive. Can’t thank you enough for this type of work! One of the key insights in this came towards the end when David explained the next bear market will shift into high gear once the scam of stock buybacks is understood by the retail public. We see the initial leading edge of this now with the revelation of what GE and Sears have done. When rates go higher making it less affordable to carry the debt used to repurchase and those repurchased shares go underwater, shareholders should resell against this practice. This will be bear market fuel. The whole discussion was top notch. Great stuff about psychology. I'm willing to bet the only thing I remember in ten years is; small correction small buy, big correction big buy. Everyone should watch this, brilliant! Great conversation! Thanks a lot! Longest recovery will be on July 2019 -very good interview and insights . Excellent interview. As David talks about investor panic, that is what is really going to create a sharp drop in the market when it breaks. Had someone tell me the other day that during the downturn in October, he was going to sell out all his stocks. But his grandchild distracted him and he didn't sell. Now he is happy because he made back all his losses "and more". This is the phychology of the retailer babyboom investor who is going to get killed in the next bear market. Forgive the misspellings, need an edit function on these posts. This was just an amazing discussion!! David brilliantly covers current conditions and the frustrations of a fundamentally experienced Manager. Although it doesn't seem like the FED is going to wait too much longer to slow down its rate hike cycle, deeper plunge or not. Afterall, who wants to destroy all this complacency. Seriously, would like to see David return to assess the damage once it really hits. Another gem from RV. Thank you Grant and David, this interview really helped me gain some calm and clarity in these often challenging and troubled times. Wonderful production too so well done all the team. In lieu of having his clients pay taxes, I'm curious why David doesn't use a long-short strategy to take some of the pain out of a decline? Sound money would go some way to fixing these imbalances. PLEASE more: investment framework, market analysis, entry timing, position sizing, experience anecdotes, thesis explanations, how to position while expecting recession Less: less “retail investors and our clients are so stupid and badly allocated”, less personal biography, less “look how dumb people always are every bull market” Thank you for the long form content. 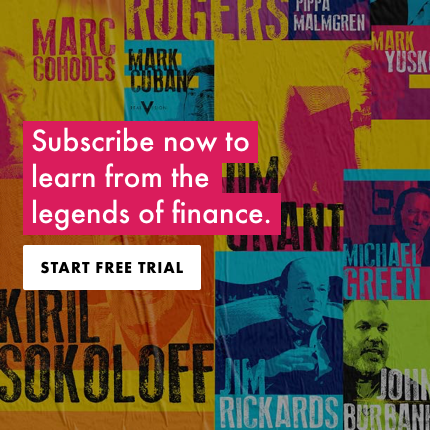 Anyone that watches longform in depth content expects a crash and please stop wasting 1hr15min of the interview talking about how stupidly positioned everyone else is, and the typical psychology of a bull market. Please focus the interview on more productive things so we can learn more from these experts you interview. Well, the interview itself needs no further comment, but I think the cameramen (or women) need major kudos for those boat shots! There were obviously two of them laying up on the deck there and it's brilliant. Milton, give them a cookie for that great work. and don't forget the drones. "The more you know in a market like this, the worse you are." Bingo. These “in conversation with” pieces are next level. Pretty sure I’ve never been grateful for a paid subscription before. I didn't know Bellevue, WA. That's a really nice spot to live. Love the boat in front of Seaview-house. As a fellow RIA/Financial Advisor for almost 30 years, I couldn’t agree more with this entire thoughtful discussion. Many Clients today are SO focused on returns and fees, and why they are not matching the S&P 500 returns, with ZERO concern about valuations and where we are in this massive Global credit cycle/Ponzi scheme. Managing fear and greed are extremely difficult in a normal cycle, while this is the most manipulated cycle I’ve ever lived through too. Clients that are passively 100% invested have NO CLUE how much risk they are taking! Thank you to David for confirming my beliefs, and for Grant for actually trying to educate the non professionals in the RV family......lastly, buy some gold for insurance and protection from the next bear market and recession, which is probably right around the corner. The Fed’s will have to print more currency then we ever thought possible, and all fiat currencies will have to devalue against real assets....which are historically, ridiculously cheap. For anyone managing money, especially small independents like myself, this video is very valuable. There should be a separate category of RV interviews, perhaps the "Yoda" series. Deden, Hay, Sokoloff and a few others would certainly qualify. This was outstanding. David is such a sage and thoughtful person who truly cares about his clients and friends and how they will be impacted by a changing economic environment. David's caution reminds me of Richard Russell's longstanding question, "what are the consequences if I'm wrong". I'd change that a little, "what are the consequences if you don't heed David's advice"? Superb interview. Perhaps the fact that retail investors are using their own money and the professionals mostly other peoples money , means that in times of crisis the professionals do better. Its an important point that is often overlooked. Most retail investors went through the GFC so hopefully they might surprise some people in the coming crisis, especially if they watch RVTV. Well done to Mr. Hay for battling through. I'd have gone to bed with a bottle of brandy. I hope he survived! An excellent interview and, as noted in other comments, great production values. However widely RV manages over time to extend its brand, these in-depth interviews will IMHO always lie at the heart of the franchise. It always will. They are our core DNA and are everything we stand for above all things. Tops. As I’m watching I’m also noticing the really high production value. The gentle movement of waves, just barely underneath the conversation. The great panning and drone shots. And obviously the conversation. As I manage my own investments with ETF’s despite a fortunately growing balance, I wonder the role of the business for serving the individual. Time well spent for all and I look forward to following gavekal going forward. Great conversation. Thank you all. Fantastic. Thanks for this. Made my conviction about the need to rationally manage risk and maintain patience that much stronger. I will no doubt watch it again. Discussions like this teach you how to do your own thinking and be a better investor. Top stuff. Grant & David looking sharp. First Class discussion! Realistic thoughts on important financial outcomes and cycles. All the best! This format is RV's USP. The fireside (or lakeside) informal chat is great and these videos I enjoy the most. if you can keep your head when all about are losing theirs? Men, it has been well said, think in herds; it will be seen that they go mad in herds, while they only recover their senses slowly, and one by one.? Kudos for doing this despite the hoarseness!